This pattern is available from etsy.com for AU$5.00. Bilbies not Bunnies! This is an original Bilby and Bush Basket pattern designed to raise awareness of the plight of the Australian Bilby. Australia does not need any more rabbits! 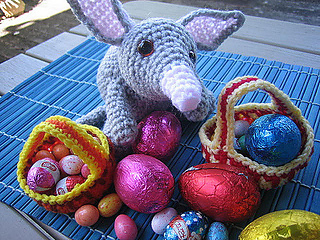 This pattern set includes full instructions for making a crocheted Bilby, or rabbit eared bandicoot and a bush basket to fill with Easter goodies. 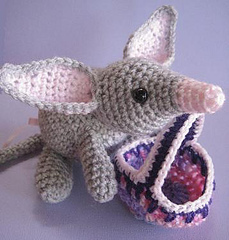 The bilby is worked in 8ply, double knit or worsted weight yarn using a 4mm hook. These little guys measure approximately 7inches/18cm from bottom to nose. Instructions are also given for a rustic bush basket to fill with goodies. Instructions are provided in both Australian/ English and American terms. So what the heck is a bilby??? The bilby, sometimes known as the rabbit eared bandicoot is a marsupial with a backwards facing pouch. Bilbies are nocturnal ground dwellers and live in burrows. They are protected in Australia as only 600 now live in the wild. There used be 2 types of bilby, but one species has been extinct since 1931. The introduction of the rabbit, fox and cat to Australia destroyed habitats and in attempts to catch feral animals, as many native ones were killed. The “save the bilby” campaign has been active for a number of years, with the slogan “Bilbies not Bunnies” used at Easter to promote the plight of this little animal. Sales from chocolate bilbies go towards conservation efforts. The rabbit has been an environmental disaster in Australia, and needs to be eradicated from our country to enable the survival of the bilby.